The computer DIY market is an interesting paradox these days. 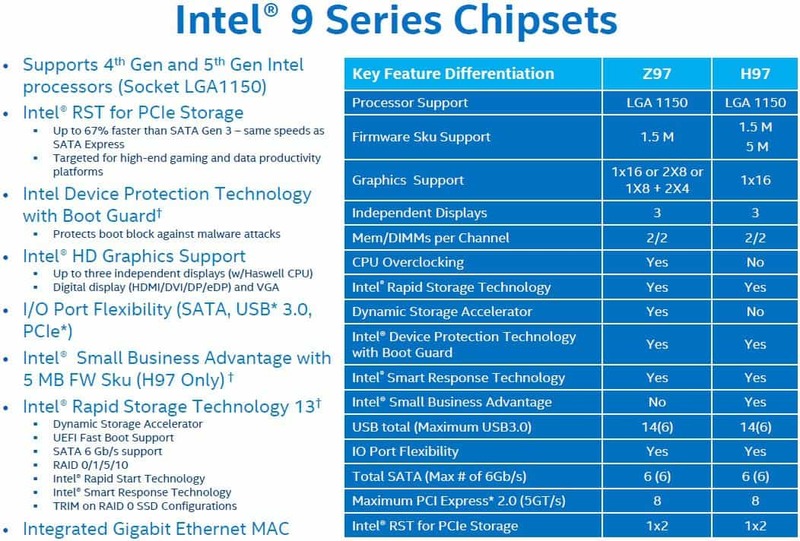 The Intel 9 Series "Broadwell" chipset motherboards released, while Z87 boards seemingly start hitting their prime with solid BIOS and software updates. In fact, there are still quite a few excellent Z87 boards on the shelves. But it makes sense since the Z97 chipset isn't really a major leap forward, with the two most obvious updates are of course SATA Express, and support for Devil's Canyon CPU support. Naturally, DIY users are wondering what makes the new Z97 chipset any better than the previous Z87 Lynx Point. 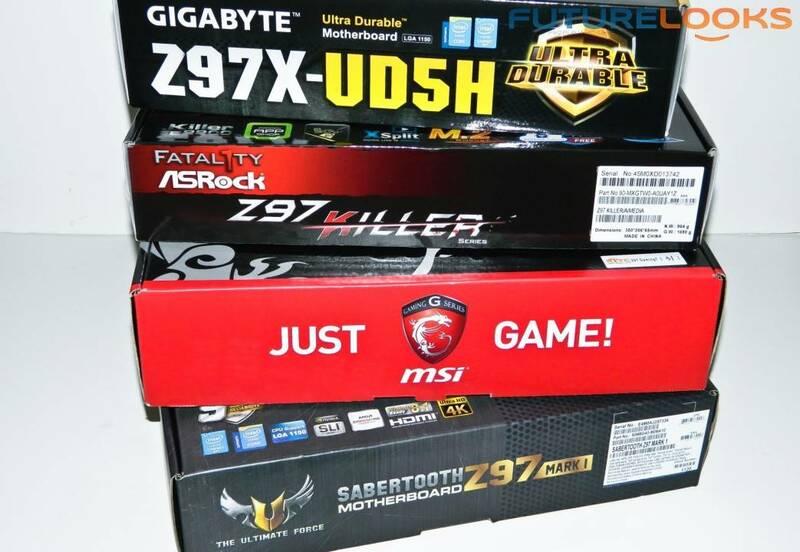 To answer those questions, we've assembled the GIGABYTE GA-Z97X-UD5H, MSI Z97 Gaming 7, ASUS Z97 Mark-I Sabertooth and ASRock Fatal1ty Z97 Killer motherboards, for a fight to the finish, in this Intel Z97 Motherboard round up! Before we look at the boards, we need to understand the nature of the Z97 chipset. This time it's about SATA Express bandwidth and Devil's Canyon CPU support. And aside from those updates, there aren't any other tangible differences. 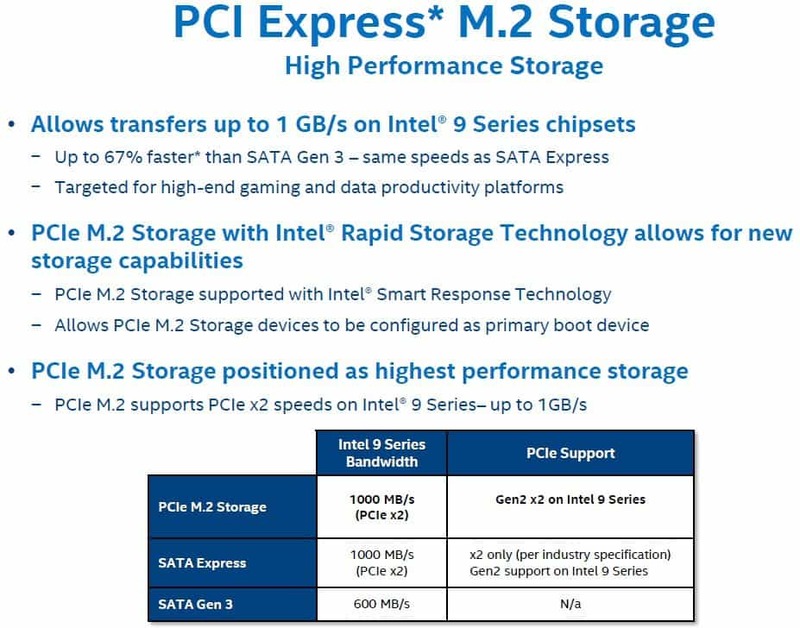 Oddly, SATA Express is missing from the diagram which is a key feature on some boards, where some of the PCIE lanes have been doubled up to improve storage bandwidth. Specifically when paired with high performance or mini-SATA M.2 SSDs, like the ones on the GIGABYTE, MSI, and ASRock Z97 boards in this round up. Along with M.2 support, SATA Express should support faster SATA based SSDs, delivering better bandwidth. For example, the M.2 mSATA connects directly to the PCIe bus and could be paired with a current SSD as little as 16GB (or higher). The standard SATA ports still benefit from SSD Caching when paired with regular platter based hard drives. One can always slap a high performance 240GB or 480GB mini SSD and skip caching altogether. In either case, you will not be disappointed. Especially when it comes to significantly reduced boot times. 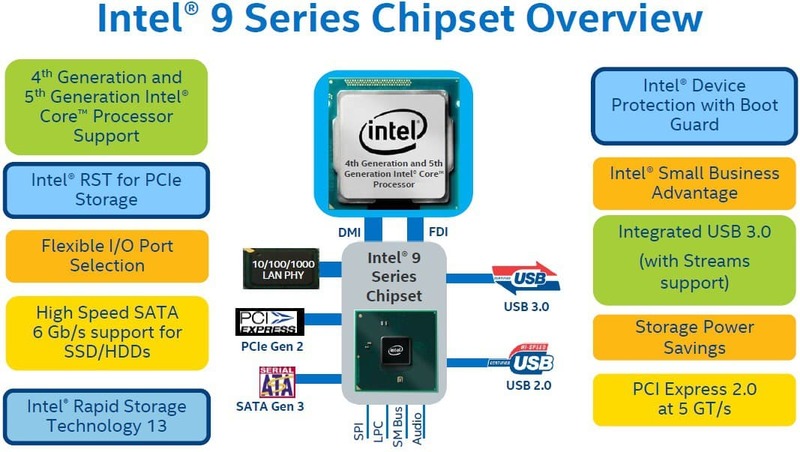 As for the chipset IO and connectivity features, there are a couple additions and changes to the Z and H class chipsets. Keep in mind, Intel partners often add their own enhancements, but you won't see a board offer less unless it's an ITX. Obviously due to lack of PCB real estate. An interesting update is the Intel Device Protection Technology feature with Boot Guard. Lets face it, untrustworthy individuals have been looking for ways to get in your system for many reasons. The minute you take your system's security for granted, you become a statistic. This is just one way Intel is trying to help if you play a little loose with your security measures. Alright, let's look at the boards so you can see what each offers in terms of connectivity, software, and extra features.